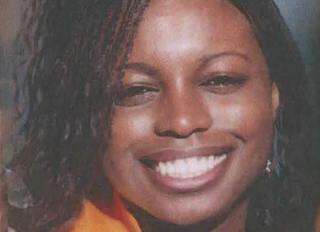 For unknown reasons—just kidding, I’ve got a guess or two—Natasha McKenna’s violent and senseless death in police custody hasn’t gotten much national attention in the months since she (a 5’2” woman, weighing 130 pounds) was taken from her Fairfax County jail cell to be transported to Alexandria, Virginia: a process which apparently required her to be restrained by six men, put in handcuffs, leg shackles, and a face mask, and then Tasered repeatedly. There is a yet-unseen video of this incident, which ends in an unconscious McKenna being removed from the jail by ambulance and taken to a hospital, where she died five days later. McKenna was wanted in Alexandria for assaulting a police officer, and reportedly, she had also attempted to assault an officer within the Fairfax jail. Though she initially submitted to having her hands cuffed for transportation to Alexandria, it’s easily conceivable that she panicked and subsequently reacted violently to the presence of six men wearing full-body biohazard suits and carrying sticks who were ostensibly there to get her into a police van but were obviously prepared to Taser her into cardiac arrest, six on one. It’s worth noting that the original incident she was charged for involved the same thing: six police officers descending on McKenna when she was “seen acting strange” at a car dealership on January 15. Diagnosed as schizophrenic since the age of 12, McKenna was not actually arrested for this incident at the dealership; in fact, according to WUSA, “sources say the warrant was issued so that she could receive treatment in jail.” She stayed in Inova Mt. Vernon Hospital’s mental health unit temporarily, and then was released. And then, she landed almost immediately back in police custody—not by harming anyone or committing any crime, but for walking into a grocery store, still in her hospital clothes, and calling the police to say she had been assaulted. According to the Post, the cause of death was attributed by the Virginia medical examiner’s office not to the Taser or the use of force but to “excited delirium,” a syndrome that seems to mostly be associated with deaths in the custody of law enforcement, and sounds very suspiciously like the disgusting racial terms used by Darrren Wilson to describe Michael Brown as somehow superhuman. Amnesty International has found “accidental delirium” to be cited in 75 of the 330 deaths associated with police Taser use between 2001 and 2008. McKenna’s mother, Marlene Williams, describes her as “lovable and friendly.” She had a beautiful smile. Her death, and the uncomfortable silence around it, is a non-accidental tragedy.